Patches of snow continue to dot parts of the landscape here in upstate New York, so I’m personally unable to validate the effectiveness of the principles set forth in Your Short Game Solution, by James Sieckmann. But I can say unequivocally that the text is a thought provoking, different perspective on the subject; and I’m looking forward to a more thorough test run of the program, with the full complement of drills and “fixes” once weather allows. 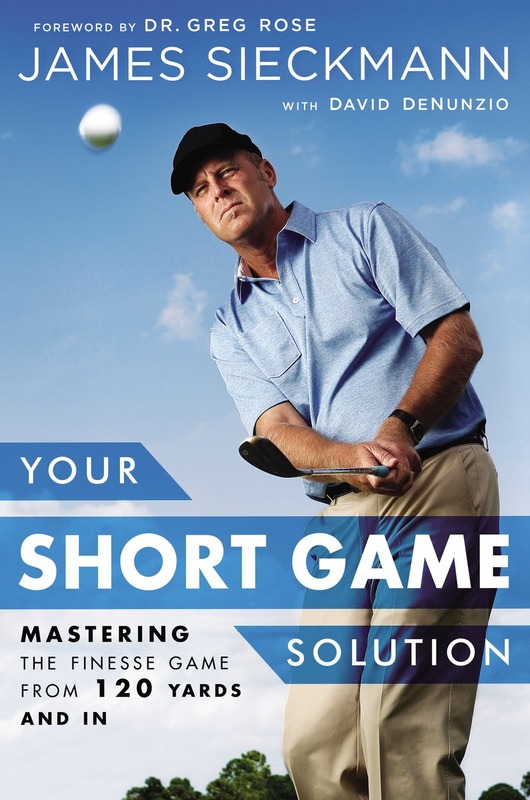 Sub-titled Mastering the Finesse Game from 120 Yards and In, and co-written with David DeNunzio, the book draws on Sieckmann’s two decades as teaching pro at Shadow Ridge Country Club in Omaha, Nebraska. The material is as much about his teaching method as proper mechanics, having studied the practice routines and techniques of short-game luminaries like Seve Ballesteros, Corey Pavin, and Raymond Floyd. Thus does Sieckmann distinguish between your “solution” and pursuing short-term outcomes popular in our attention-span-challenged culture. Along the way, he strives to expose a number of erroneous, or at least misleading, axioms applied to short game play. One such example is that it’s always prudent strategically to lay up to your favorite distance for a full-swing shot. Another is that keeping the head steady is necessary for hitting quality finesse shots. Sieckmann observes that great short game players typically shift everything forward, noggins included, when playing finesse shots. He even recommends we reinvent some of the terminology customarily applied to the short game. This is indicative of another feature of Your Short Game Solution, namely that it’s word-driven. There are occasional photos demonstrating club positions, set-up, and so forth – usually using Sieckmann’s PGA Tour pro pupils as subjects – and the odd URL to help make a point. But you don’t need your smartphone, video equipment, or launch monitor to implement his teachings, which he emphasizes should be reinforced by recording your progress and observations in writing. 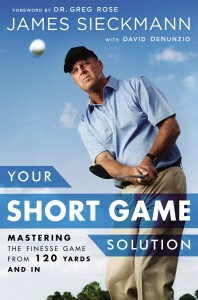 As such, this is a book for golfers who respond best to oral cues, versus visual ones. At just 171 pages, it’s a highly digestible read, but of course committing fully to the drills and exercises would, as Sieckmann acknowledges, be more time-consuming. Still, Your Short Game Solution is an efficient treatment of the subject. Gotham Books, hardcover, $27.95.